Powerlines, the exceptional slogans that people remember long after the campaign ends, stand out from the barrage of marketing messages consumers face each day. A product, service, company, candidate, or an organization with a powerline outshines the competition every time. Steve Cone, author of Steal These Ideas!, reveals the secrets to contemporary marketing′s biggest mystery: how to conjure the phrase that will make a product irresistible and memorable. This book restores the lost art of creating killer slogans to its proper place: front and center in every campaign. 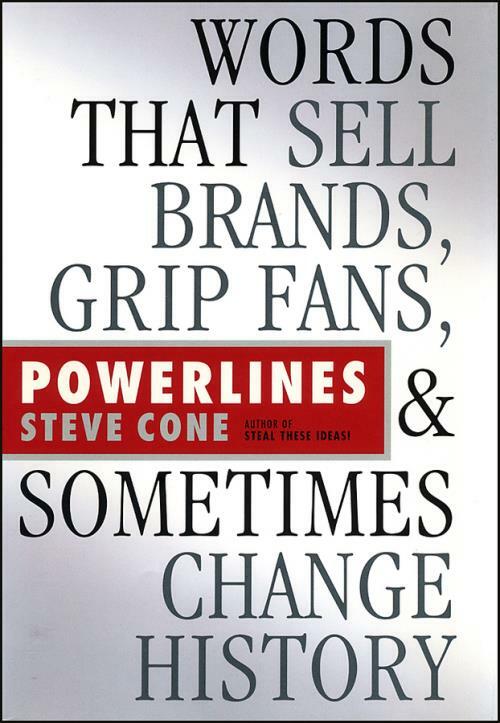 Drawing on examples of great and not–so–great lines from marketing, politics, and popular culture, Cone provides an irreverent, intelligent, and insightful primer on a singularly important aspect of brand building. Introduction: Car 54, Where Are You? Getting the Right Few Words to Every Nook and Cranny on the Planet. Factors Distinguishing Powerlines from 99 Percent of All Written and Spoken Language. 2 Powerlines Take to the Air. Radio, Television, and Powerlines: A Match Made in Heaven. Part Two: The Powerline Perspective. Countries, Candidates, Cultures, and Companies Rise or Fall on Powerful Lines, Mottos, and Sayings. 3 Uncle Sam Wants You, Your Mind, and Your Money. How Governments Win Hearts, Minds, and Paychecks. 4 You Can′t Put the Toothpaste Back in the Tube. Why the Candidate with the Best Slogan Wins the Race. 5 Shots Heard Round the World. How Eloquent Speakers and Writers Make Us Think and Rethink. 6 There Is Nothing Wrong with Your Television Set. How Writers and Marketers Keep All Eyes Glued to the Screen. Part Three: Put a Powerline in Your Tank. Putting Powerlines to Work in a Marketing Campaign. 7 When It Rains It Pours. Getting the Brand Promise Through Whether Customers Want to Hear It or Not. 8 Jingles All the Way. Commanding Attention with Music and Jingles. 9 The Gun That Won the West. Transforming Ordinary Products into Extraordinary Brands. Speaking in a Distinctive Voice: The Persuasive Power of Characters from Pitchmen to Spokescharacters to Spokespeople.